Organic rose hip vegetable oil, rich in essential fatty acids (linoleic acid), smoothes the skin and improves the complexion for uniformity and radiance. It promotes cell regeneration and prevents skin ageing. Softening and moisturising, it is ideal for devitalized skin and for smoothing out cutaneous irregularities. This oil is not advised for skins with acne. 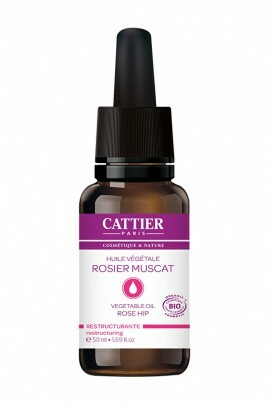 Rose hip vegetable oil can be used pure on the face, body and hair. On the face, before your Cattier day or night care, apply with gentle massage the rose hip vegetable oil as an anti-ageing serum to prevent skin ageing. It is ideal for a body massage to smooth and strengthen the skin. For shiny and nourished hair, apply sweet almond vegetable oil before or after the shampoo.